No one should be forced to wait six weeks for vital support, when rent is due, bills are stacking up, and you have a family to feed. But that’s the reality for thousands of people on Universal Credit because of the problems with the system. Luke’s appeal was dismissed. This is a devastating outcome for him as he won’t only be stuck at home with minimal support he also risks losing his support team, who were with him for 18 years. 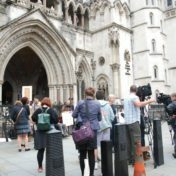 The outcome is also disappointing and worrying for other Disabled people, as this case sends a message to local authorities that they can implement whatever cuts they want as long as they follow the right process. What is your experience of Universal Credit? Please send your experiences – of the application process, the impact of being paid a month in arrears or any other information you would like to give – for an inquiry on the roll out of Universal Credit. Deadline 10th October. Civil society organisations, including Inclusion London, the British Institute of Human Rights, the Children’s Rights Alliance for England, the Runnymede Trust, and Just Fair, have come together to express disappointment at the Government’s decision to accept fewer than half of recommendations received to improve the UK’s human rights record. Guest post by Emma Vogelmann. 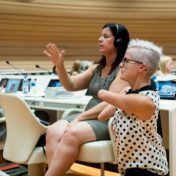 As a disabled rights activist, you are used to fighting for your voice and concerns to be heard by others, particularly by others who can affect real change. So you can imagine how surprised I was when I was asked by Inclusion London to be on a panel of young activists at Amnesty International’s International Council Meeting (ICM) in Rome! 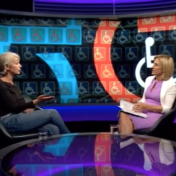 Inclusion London CEO Tracey Lazard was on Newsnight speaking about the UN’s damning verdict on the Government’s treatment of Disabled people, following the release of the UN Disability Committee’s Concluding Observations. Give your views on product reviews! 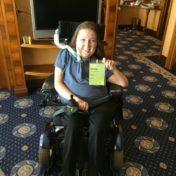 Rica, a consumer research charity is developing online product reviews for disabled consumers and are asking for Deaf and Disabled people’s thoughts and ideas on how best to make the reviews relevant, accessible and inclusive. If you are a direct victim or an indirect victim of online hate the Mayor’s Office of Policing and Crime (MOPAC) invites you to fill the Victim’s experience survey. 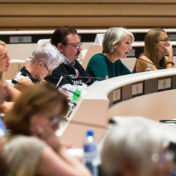 The UN Disability Committee were clear and robust in their condemnation of the impact of austerity on Deaf and Disabled people and the Government’s abject failure to implement the Convention and engage with DDPOs.